Hey ya’ll we made it to Tuesday! We are on the right path towards the weekend! I was talking with K the other day about bucket lists and what was on ours. I’ve split mine up into several lists. Something my Dad always had going was a list. I have a travel list, race list, personal list. I guess I could combine them, but this way I can keep them straight. I was making a comment how the NYC Marathon is a bucket list race and never in my wildest dreams was it in my radar before. I’m so glad that he encouraged me to sign up for the lottery and I was fully prepared to be disappointed. But shock and the oh my moment, of what did I do took over when I got the email that I had made it into the TCS NYC Marathon! But this got me to thinking what other races would be on my “Race Bucket List”. I’ve run the Marine Corps Marathon, that was my first ever marathon. It was a great experience and I’d cherish the opportunity to run it again. I would love to run the Boston Marathon, but I’m so not fast enough to qualify. And right know, I would need to be a 80 year old woman and I would get in. So to go to Boston, I would run with a charity and still be able to run one day. Of course, my list would not be complete without a few Disney Races. I would love to run all of them at some point. So they are all on my list. No surprise there. I’m sure there’s more that I’d love to run. My uncle is a master runner and I would love to do a race with him at some point. He’s always pulling in the awards. Big Sur maybe. I guess I need to write these down now and cross them off as I do them. I have a “Places to Travel” list and there’s lots of place there I’d love to go to see. One place on my list would be Fiji. That would be a once in a lifetime opportunity and I would love to go to get away and not think about work for a few days, and really relax. Ireland, and Iceland would be great getaways. Germany during Oktoberfest! Maybe a trip to the mountains. A cruise to the Caribbean, nice warm weather and food out the ears! So many ideas. We’ll see what happens. I always have a bug to travel. And am always looking for the next adventure. I need to write these down as well. It looks like I have some things to do and lists to make. 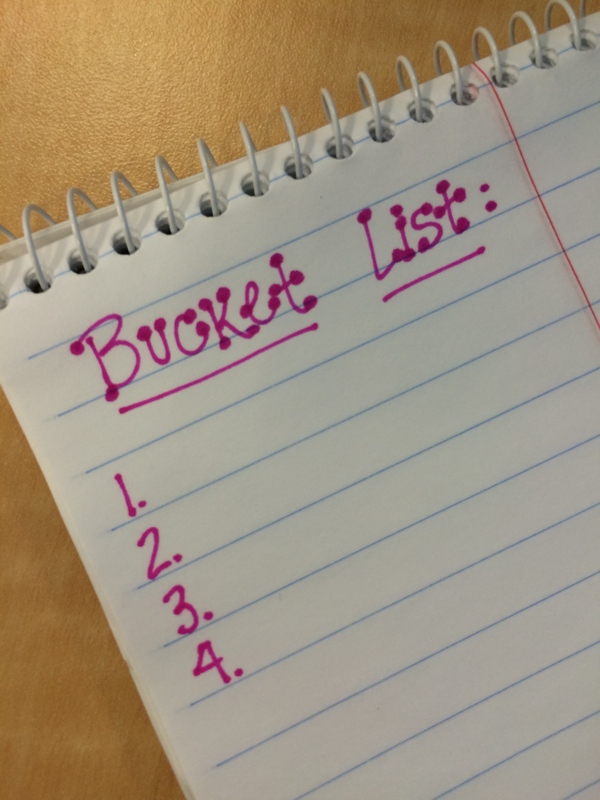 What is on your bucket list?